Dont call me for a quote or demo…just gimme instant downloadable trials! I don’t post much here on ITBabble and Patrick rightfully makes fun of my anemic post count. So, what better way than to jump in again with a rant. When evaluating tools, Patrick and I often at the complexity of getting started. Is there a complicated or confusing sign up process? Is there something you have to download? Do they make it easy? Is there a sensible and easy to understand pricing structure? All these are important considerations. Today I wanted to evaluated Matlabs from Mathworks for possible use in our school’s robotics program. I wanted to download a trial, plug in my NXT Brick (the robot’s main device) and start playing around with it. I knew I would have to spend some time going through the manuals and tutorials but was ready to get started. What I ran into was analogous to a brick wall. A wall of highly convoluted pricing and licensing structures that left a bad taste in my mouth. All I wanted to do was test it out…but according to the message I got, some dude is going to call me up and “qualify me further”. I already felt bad for not posting enough on our blog, now this guy is going to evaluate me and pass judgment on me…am I “qualified” or not. I’m sure Tony, who is an IT Director, prefers simple and straightforward licensing structures. He has to deal with not only budgets but then ensuring that the campus is compliant. I know I would. So complex and convoluted licensing schemes may serve to protect the company from piracy. Alas, a quick search on a torrent site uncovers their entire library of tools. So, uhm, that didn’t work. Ok, so they do this to eek out as much money as they can from each campus. Fine. They are a business. But I am a teacher (or a student) looking to evaluate a product – I am not a decision maker. I need to be able to access a trial as easily as possible; play around with the software/system; evaluate it; then push it to the IT Director to include it in the next budget. In my case, I’m looking to get their Matlabs software to allow students to connect to their Lego NXT brick and program it. I would have 12-20 students using the software. There are alternatives for sure and some that are free. The makers of Matlabs may have created these structures to deal with engineering schools, tech institutes, and or whole districts. In closing, if they are selling their software to massive institutions, they could just as easily provide a simple trial download for the small-fry cases like myself – why spend time and resources “qualifying” me. Just gimme the freaking download so I can test it already. 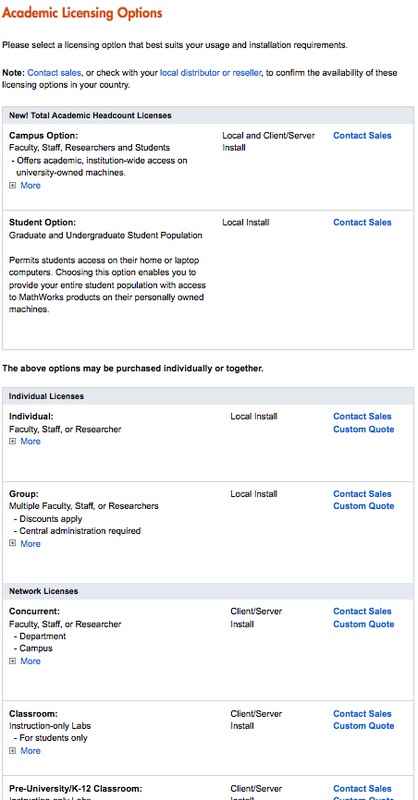 Oh and here is an image of their licensing options that I couldn’t make small enough to fit on a single page. This entry was posted in Omar Ghosn, Opinion. Bookmark the permalink. 3 Responses to Please Don’t Call Me!
. It’s time for vendor smack down.